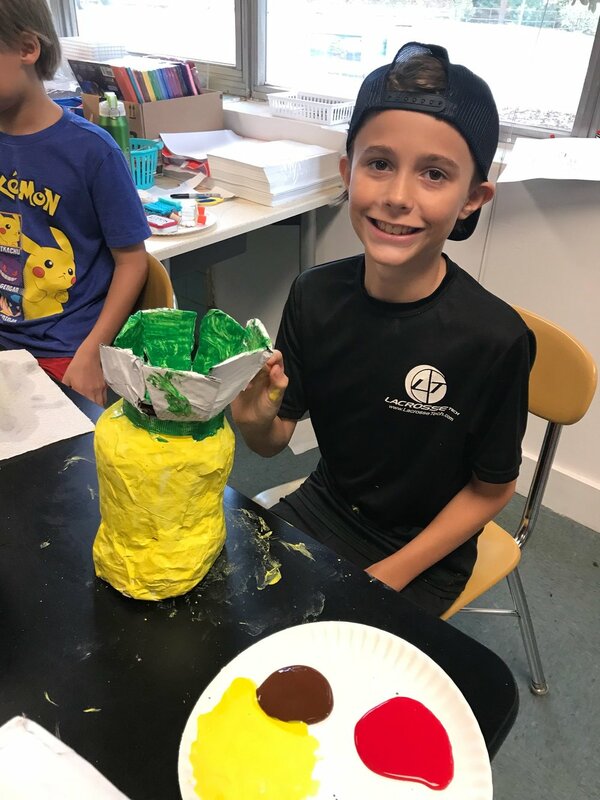 Arts Together is thrilled to offer a series of fun and enriching summer camp programs for 9-to-12-year-olds at Raleigh Charter High School, conveniently located only a five minute drive away from Arts Together. Campers who participate in the Arts Together Summer Sparks camps will be able to take advantage of Raleigh Charter's gorgeous facilities. Families looking for special arts and educational enrichment programs for their children won't want to miss out on these exciting camps, taught by full-time teachers (many from the Wake County Public School System). Sign up for one half day camp or do a full day with two camps! All campers should pack a snack and a reusable drink container each day. Those attending all day will have a supervised 30 minute lunch period and will need to bring their own lunch and two snacks. Take a look at our new, interactive 2019 Summer Programs brochure to see our full line-up of exciting summer arts programming for ALL ages! Sign up for one half day camp or do a full day with two! NEW THIS YEAR – Pay for camps in monthly installments! Scholarships available for full and half day camps. Jewelry making is a fun outlet for anyone with an eye for design and fashion! With a few basic tools, we create beautiful accessories to wear using recycled and repurposed materials, including friendship bracelets, paint chip earrings, safety pin bracelets and more. At the end of the week, campers take home their three jewelry making tools (round nose pliers, flat nose pliers, cutters) and all the fabulous jewelry they designed. NOTE: This camp has a $20 materials fee. Prepare to be blown away! In this rock camp, we learn how to play basic rock n’ roll instruments like the drums, bass, guitar and keyboard. Our band also transforms to give everyone a chance to play their favorite instrument or song. Bring your instrument or borrow one of ours, and come with a song in mind that you want to play. Age appropriate and socially productive lyrics only please; choose your songs wisely! This tap dance camp for 6-to-12-year-olds gets toes tapping and bodies moving! Campers learn basic tap principles, warmups, skills, steps and combinations. A focus is placed on rhythm, musical concepts, such as dynamics and tempo, and basic musical structure. We also explore the dance’s history – looking at past and present tap dance performances and choreographers! NOTE: Dancers must wear tap shoes, bring a water bottle and be dressed in clothes that are comfortable for movement. Long hair must be pulled away from the face. Have a mind for wizard skills? Then this way to parchment, cloaks and quill! We study myths, legends, lore and wondrous things that came before. Campers build their own wands, explore magical plants, practice potions and transform through movement. There is magic to find in the world around us, and we might just discover we’re magical too! NOTE: Because full day camps meet in the morning and afternoon, campers should bring two snacks and a lunch each day. This camp also has a $20 materials fee. Discover the creativity in fabric while designing your own! We explore dying, block printing, stenciling, screen printing and more. Campers use their custom fabrics to create their own self-directed projects while learning basic hand-sewing and stitching techniques. All genders welcome! Sewing is a handy, lifetime skill – add it to your artistic repertoire. NOTE: Because full day camps meet in the morning and afternoon, campers should bring two snacks and a lunch each day. This camp also has a $20 materials fee. Join us on a wet and wild adventure! This mixed media camp takes water forms to the next level. Campers play with water, creating tornadoes, hurricanes, icebergs, waterfalls, thunderstorms and more. We also construct 3D models of igloos, rainforests and other wonderful water worlds! No rain coats required but plan on getting wet. Smocks provided. NOTE: Because full day camps meet in the morning and afternoon, campers should bring two snacks and a lunch each day. Bring your art to life while learning the basics of traditional animation! Campers experience the thrill of adding movement and sound to their art making, whether they love to paint or draw or prefer abstraction over realism. We work individually and in teams to create our super short films. Let’s rock with an electronic twist! We explore cool sounds by breaking down songs with stations featuring electronic instruments. Campers also sing karaoke as a group and can team up to start a band. Music-related video games increase the fun and the challenge! NOTE: This camp has a $20 materials fee. Think outside the box and transform recycled materials into high-end runway fashion! Using plastic bags and bottles, corks, bottle caps, drink pouches, fabric scraps and more, campers create unique garments and accessories – the possibilities are endless. On Friday, we celebrate our designers with a runway fashion show! NOTE: Campers should bring an old t-shirt on the first day. Because full day camps meet in the morning and afternoon, campers should also bring two snacks and a lunch each day. Available at Raleigh Charter High School only, campers can stay for up to an additional 45 minutes, rounding out their day with extra activities. As a parent, this option gives you more flexibility in your travel time! Children enrolled in afternoon camps may be picked up as late as 5:15 PM.